Dale View was a large property on Sitch Lane, Oker. The house was always known as Dale View and had been built around the core of a small farm. An 1897 advertisement for the property described it as a "desirable Freehold Gritstone built villa residence, known as "Dale View," situate at Oaker, containing dining-room, kitchen, four bedrooms, pantry, cellar, with large store room, house and loft over, paddock ...". It was then occupied by Mrs. Gibbs. Some time after the First World War Captain Charles Blyth Ward rebuilt or extended the house. He registered other property from this address in 1925, giving his occupation at the time as "Gentleman". Charles Blyth Ward was born in Sheffield on 27 Dec 1874, the son of Septimus Henry and Emma Ward. He was educated at Charterhouse School, Godalming, Surrey. His father founded Sheaf Brewery (S. H. Ward & Co. Ltd.) which was on Ecclesall Road, Sheffield and they produced Ward's beer. Charles Ward became a Director of the firm. Like many others, he joined the Territorial Force Reserve before the First World War and in 1910 the London Gazette announced his Captaincy of the 3rd West Riding Brigade, backdated to 18th February, 1905. He had married Mary Kate Thompson, who was born in Australia, in 1899 but they divorced in 1917 and he subsequently remarried. In the mid-1920's he "employed Twyfords to build Two Dales Cafe for three of his wife's spinster sisters", the Misses Duke. He seems to have been a Company Director of various firms including Atkinson Brothers Ltd. of Sheffield. Mr. Ward left Dale View in 1941, moving to Hurker, Farley. Whilst he was living at Oker, Charles Ward also owned land at Farley and around Flash Dam. He owned the grouse moor between Hurker and Flash Dam, including a large part of Matlock Moor. His obituary notice said that he regularly shot over the ground before the Second World War. He died in April 1950, aged 75, leaving a widow (Eva) and two daughters. 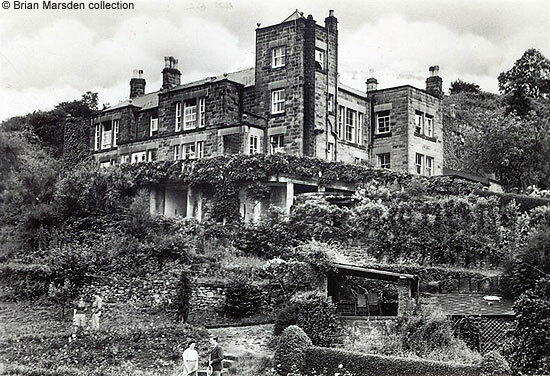 Dale View became a home for evacuees during the Second World War and then a bible college/holiday retreat, which is what it was when the above photograph was taken. The building was demolished about the mid-1950s because subsidence had made it structurally unsound. A bungalow was later built on the site of the tennis courts. Postcard in the collection of, provided by and © Brian Marsden. Taylor, Keith and Brown, Trevor "A Derbyshire Parish at War" (about South Darley), with thanks to Ray Ash. "Derbyshire Advertiser and Journal", 30 April 1897. Taylor, Keith (2002), "Darley Dale Remembered Through 50 Years of War and Peace", ISBN 1 898941 79 3, Country Books, Little Longstone, Bakewell, Derbyshire, DE45 1NN, p.260. The National Archives, Divorce Court File: 8882. "Derbyshire Times", 23 May 1941. Tues June 10th. Auction Rooms Alfreton. Sale of Antique and Modern Furniture removed for convenience of sale from C. B. Ward, Esq., Dale View, Oaker, Matlock. "Derbyshire Times", 28 April 1950. Obituary.